The Kaleidescape Cinema One, (or the K-scape we call it here at HomeTheaterReview) the high-end storage locker for your blu-rays (and more) has just been recognized for its excellent product design and is the winner of a Red Dot Award. The server can import and store hundreds of movies and allow you to watch them instantly sans previews and promos and even menus. Kaleidescape, Inc., the market leader in movie servers, today announces that its Cinema One has won the highly coveted Red Dot Award for Best Product Design. The Red Dot Award is one of the world's most prestigious design awards, given for aesthetic forms, well thought-out innovations, and groundbreaking trends. Cinema One was designed in collaboration with Whipsaw, an industrial design and engineering consulting firm located in the heart of Silicon Valley. "The goal was to create a device that was fresh, contemporary and exuded a level of sophistication that would stand out among other audio/video components in the living room," said Cheena Srinivasan, founder and CEO of Kaleidescape. "With Whipsaw's help, we were able to create a product that not only delivers the highly acclaimed Kaleidescape Experience but also looks good and is super easy to use. It's a product that people will want to display rather than hide." The Cinema One design deliberately rejects the austere black box aesthetic. Wrapped in a sleek aluminum-finished case, it features a white faceplate, on which the backlit Kaleidescape logo animates when the system is turned on and when music is playing. Status indicators and control buttons glow from within only when active, and recede into the background when not in use. 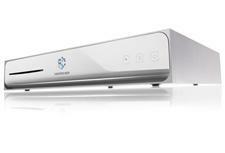 "Cinema One features a clean, light, and graceful design that subtly communicates a sense of refined technology. We strove to make Cinema One the ultimate companion to the brilliant Kaleidescape Experience," said Dan Harden, CEO and principal designer at Whipsaw.